There is a lot of bad information about coin cleaning. Scan the "net" and also read the comments on some of the coin forums, and you will seen lots of bad information. You need to always remember that information on the "net" is not always good, sound advice. You need to be very careful with your cleaning if you use a metal detector to find coins, especially any copper, or metal other than silver. 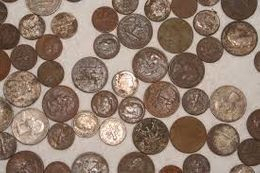 Most times badly damaged copper coins that have been in the ground for many years will not clean. I will try and give you the best information and the techniques that prove to be the best when cleaning coins. The information here is about the techniques used to clean coins from change or found in the ground using a metal detector. For instance, if you like the look of the green patina found on many of the oldcopper coins like Indian Head Pennies, as I do, then cleaning them may remove the patina. You need to ask yourself before any cleaning takes place what kind of effect you want your coins to achieve. You need a plastic container, do not use any other container, you could scratch your coins if you do.Fill the container with warm water. Add a small amount of detergent; mild dish washing detergent is best. Gently add your coin, or coins into the container, rub both sides between your fingers, and be very gentle here. You don’t want to scratch the coins. If you add more than one coin to thecontainer, be careful you don’t have them scratching each other while in the mix. After the cleaning, put the coin, or coins into another plastic container of distilled water. This is a rinse that is used to remove any grit that may be on the coin. Again, be very careful. When your finished with the distilled rinse, you need to rinse the coin again, this time under running water. Make sure you get all of the soap residue off and any extra dirt or grit that may still be on the coin. Remember to be very gentle; it doesn’t take a lot to scratch your coin. You’ll need an AC/DC adapter. 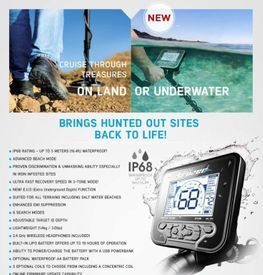 It can be a 9, 12 or 18-volt type. The high voltage does work better. You can use an adapter from an old phone for this method. 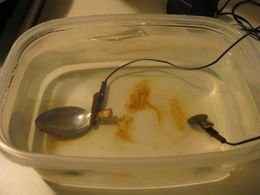 Also needed are a stainless steal spoon, a glass, and some salt.Now strip the end of the wires on the adapter. You need to separate them first. Attach an alligator clip to each end. If everything is right, the coin will bubble. In a few minutes your coin should begin to loose the crust that has built up on it over the years. You’ll notice the gunk in the glass. Your coin should be clean in about 5 minutes. And here is the most basic information regarding the care of coins. 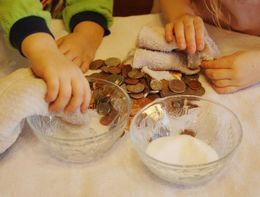 Coin cleaning with this technique is used best with older coins. You may need to experiment with different amounts of salt for best results.